I have a confession to make – I bake on the fly. Sometimes I just put a pinch of this and a pinch of that to make fantastic loaves or disastrous dough balls. It happens every so often – sometimes there is a method to the madness and other times it is just madness ! Makes me wish I were more like Amedial Bedelia, except for the literal interpretation of English Lagrange. If you don’t know who Amelia is – read some of the Peggy Parish’s original works. Though these books are meant for kids it is delightful for anyone’s inner child . So, what is the big idea – you ask? Well it was during one of winging it episodes that this bread was first made. Now I make a rustic artisan loaf pretty much once a week. These are usually for the kids’ lunchboxes. If I don’t change it up often chances are that I find the lunch in the thrash bin , except for pepperoni pizza. 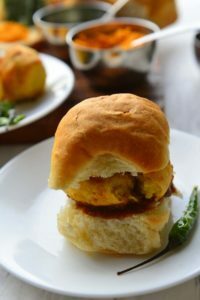 Hence we switch things up – either in the bread or in the fixings. 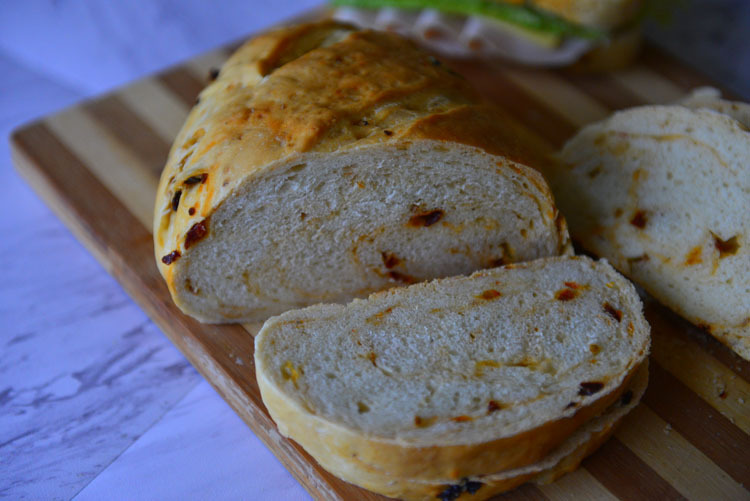 So here it is – the flavorful , tangy , beautiful, and rustic “Sun-Dried Tomato And Herb Bread”. The sun dried tomatoes have beautiful sweet and tangy flavors. When sliced you could see the beautiful specs and lines of red through out. 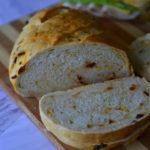 Using sun dried tomatoes mean that you don’t have to wait for fresh produce to bake a batch of this bread. A bit of color during the cold days of winter is always welcome. This is a rustic free form loaf. No need for bread pans and the such. If you have a pizza stone heat in the oven and when ready to bake slide the loaf right on top of the hot stone. I just use a cookie sheet lined with parchment paper. It still makes a beautiful loaf. Sun dried tomatoes in oil is the preferred version in this recipe. The tomato flavors concentrated, but not dried out like a prune. 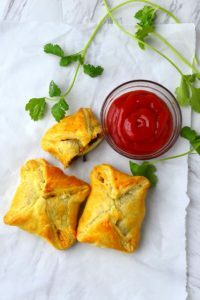 You can either use sun-dried tomatoes in herb oil or add your own pinch of dried herbs in this recipe. And before I forget this is a diary and egg free recipe. But trust me you aren’t going to miss either in the end product. 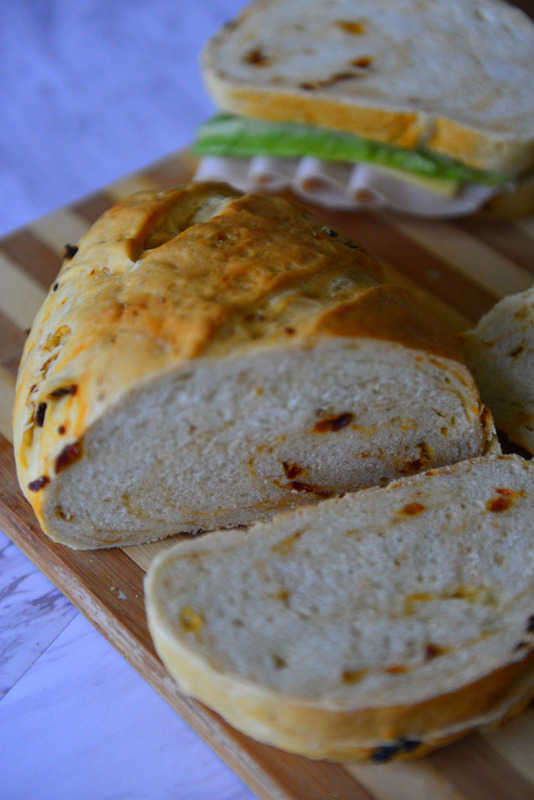 In summer when fresh tomatoes are in season I make another tomato bread with fresh tomato puree. The bread dough is made the usual way and set aside to rise. Drain the sun dried tomatoes from oil and chop into small pieces. Tomatoes will be oily, and if you were using ones in herb oil there will be extra herbs as well. Don’t worry about it. 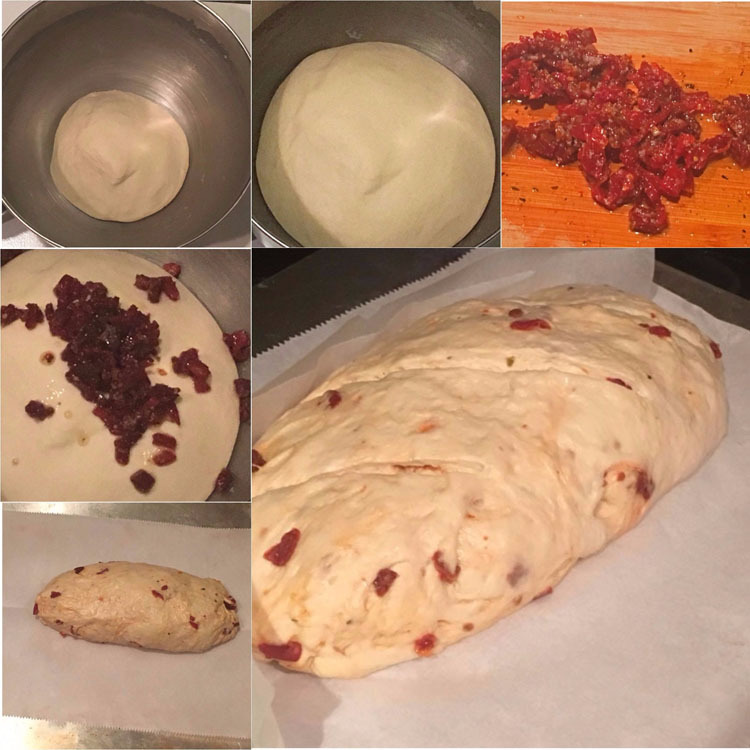 Mix the dried herbs with the chopped tomatoes and add to the risen dough. Knead in. It is going to take about a minute of careful kneading to distribute the tomato pieces. This kneading process is important as it breaks down some of the tomatoes and creates the beautiful red streaks in the loaf. I make these as free form loaves, but there is nothing stopping you from placing these in a loaf pan. Either way , cover let it rise till almost doubled and bake. Once cooled slice and make sandwiches or serve with your favorite bowl of soup. 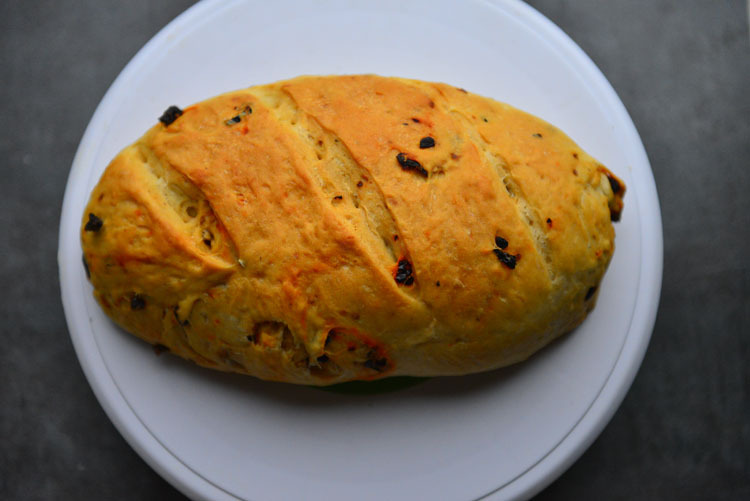 A rustic loaf with flavored with herbs and sun-dried tomatoes . Perfect for sandwiches or soups . Warm about 50g or 1/4 C of water to 100°F , or just warm to touch. Mix in the honey / sugar and sprinkle the yeast on top. Let it sit for 5 to 10 minutes until the yeast is bubbly. If the yeast does not bloom and the solution does not turn frothy discard and start again. Take the flour and salt in a large mixing bowl and stir well. Make a well in the center and pour the activated yeast solution along with the olive oil and half of the water. Knead everything together adding the remaining water as needed. Knead for about 10 minutes until the dough is soft and elastic. Form into a ball and place in an oiled bowl. Cover and let it rise in a warm place until doubled - about 1 to 1 1/2 hours. Drain the sun dried tomatoes from oil. Chop into small pieces. Mix with the dry herbs. Add the tomatoes to the risen dough and knead for 1 minute to distribute evenly. Form into a log and place on a baking sheet. Cover with a damp towel or plastic wrap and let rise until almost doubled. Pre-heat the oven to 400°F (205°C). Place one rack in the center and another right below it. 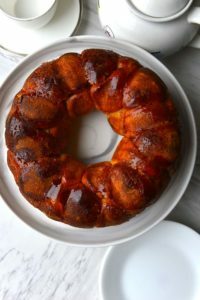 Place a small metallic pan (cake tin/ half sheet pan/loaf pan etc.) in the lower rack. Uncover the loaf and slash the top with a sharp blade (knife, craft cutters) and transfer to the oven. Add a cup of ice cubes into the pan placed on the lower rack. Reduce the temperature to 375°F (190°C) and bake for 10 minutes. Reduce the temperature to 350°F (175°C) and bake for an additional 20 to 30 minutes or until done. When the bread is down it should sound hollow when tapped on the bottom. Another way is to read the internal temperature - it should be 190°F (88°C) when cooked through. Remove from the oven and let rest on the pan for 5 minutes. Transfer to a cooling rack and cool completely before slicing. Slice, divide into small batches , wrap in wax paper/ parchment paper and freeze in freezer bags. The volume measurements are approximate. When not using a weighing scale pay close attention to how the dough feels as you knead. Fresh Herbs can be substituted for dried. Use up to 2 Tbsp of coarsely chopped fresh herbs. This recipe can easily be turned into a sourdough version. Use 200g or about 1C of sourdough starter and reduce the flour by about 100 g ( about 1 C) and water by 100 g or (a little less than 1/2 C) . The sourdough version of the bread takes longer to rise – double to triple the amount of time taken by the active dry yeast under the same conditions. Up to half of the flour can be substituted with whole wheat flour without altering the recipe much. For each cup of whole wheat flour being substituted add about 3 to 4 tbsp more water.